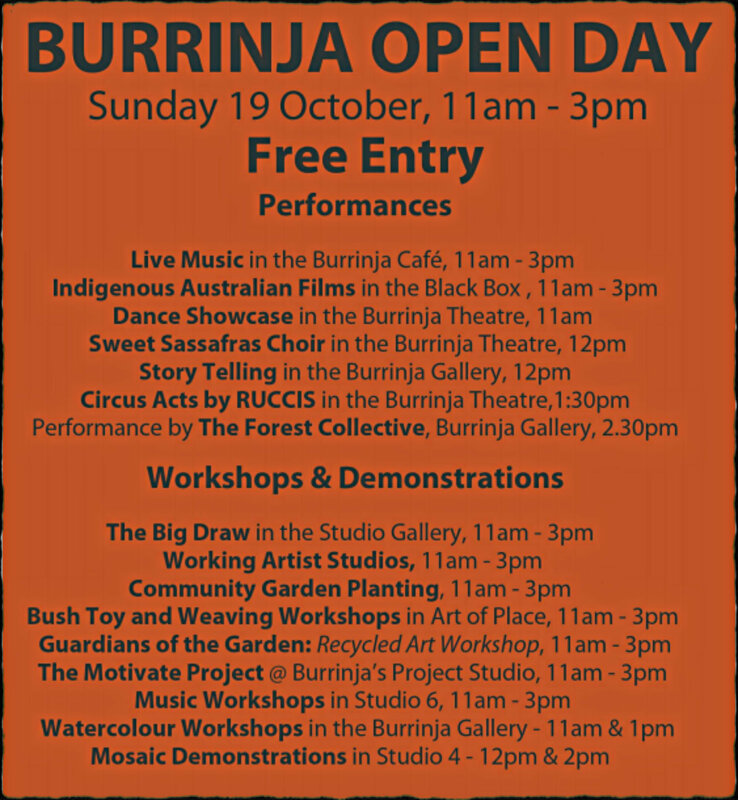 Burrinja is having an Open Day on Sunday 19 October from 11am to 3pm at Cnr Glenfern Road and Matson Drive, Upwey and ENTRY IS FREE. It will be a day of artistic activities to inspire the artist in you. There will be all forms of art, be it visual, theatrical or experiential, as well as a range of performances and workshops by The Forest Collective, RUCCIS Circus, Sweet Sassafras Choir, The Motivate Project and other local artists and performers. First let us tempt you with a teaser of what to expect on this culture packed day. Below is a picture of what you can expect to see at the 12pm Mosaic Workshop with Jessie Yvette Journoud-Ryan. 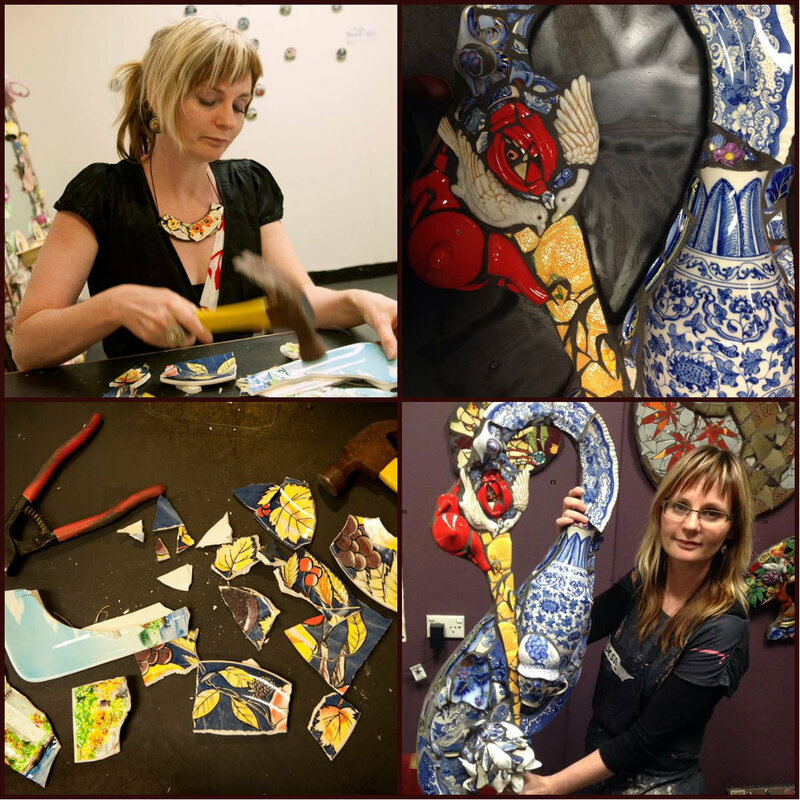 A studio artist at Burrinja working with Mosaics 'With a Twist', Jessie's 3 dimensional mosaics derive from over 2 decades of experience in the Fine Arts and influences from her French and Australian backgrounds. The Grouting demonstration is also with Jessie at 2pm. As always, LIKE their FACEBOOK PAGE to keep abreast of events. Check out the Performances, Workshops and Demonstrations listed for you below to make it easier to plan which activity you would like to interact with. While you are there, you can also check out other exhibitions currently in place at Burrinja. CLICK HERE to find out what else is happening. Keep in mind that even though ENTRY IS FREE, there is a performance at 3pm which you can attend as per picture below for the cost of $22 a ticket, and $15 for concession, so come prepared to 'sit at the table' of yet another Burrinja offering. 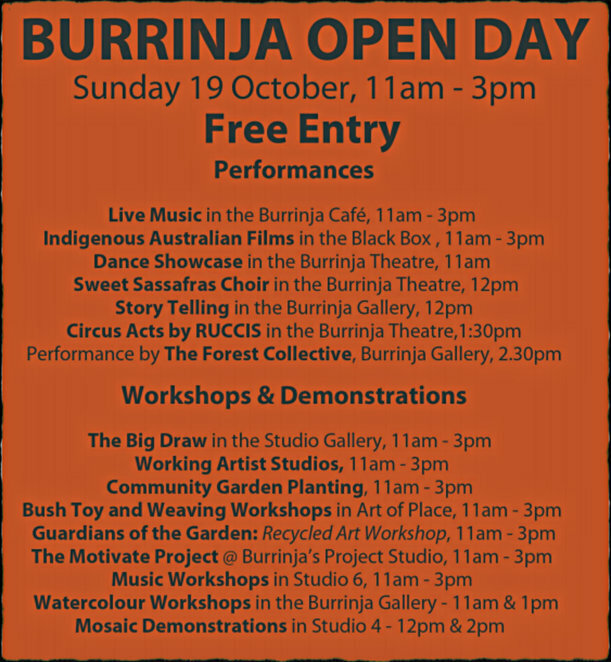 Burrinja's mission is to foster Arts in its many forms and they are a vibrant community cultural centre that lives up to their vision. Their events calendar is always filled with opportunities for artistic, cultural and environmental experiences and they take their arts to the community as they did with their recent annual event HillsceneLIVE which was a great success. This encourages a sense of local identity and community participation in cultural activities. 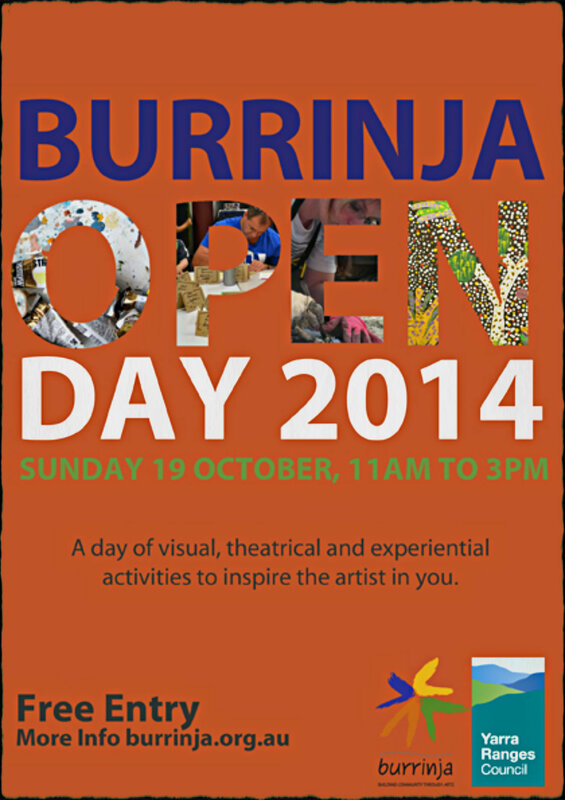 Burrinja works close with the Yarra Ranges Council and agree to work to recognise the diverse and unique character of the Shire. Their delivery of service is sensitively managed towards both indigenous and environmental issues. As an independent cultural organisation they have been awarded 'Best Small Museum - Victoria' for 2010 and 2013. That just tells you what fabulous work they do in producing programs, projects, exhibitions, performances and 'MIRACLES' with a very small team on board and very little resources. Cost: Free Entry, however there is a theatre performance at 3pm. Tickets are $22 & $15 for concession.